It’s not uncommon for label printing projects to encounter bumps in the road on their way to completion. These problems often include a design that looks great on your computer monitor but doesn’t look the same on press. Or, maybe the colors on the label don’t match your brand standards. Another very common road bump is missing fonts and artwork that your label printer needs to make sure the job is a success. Not to worry. 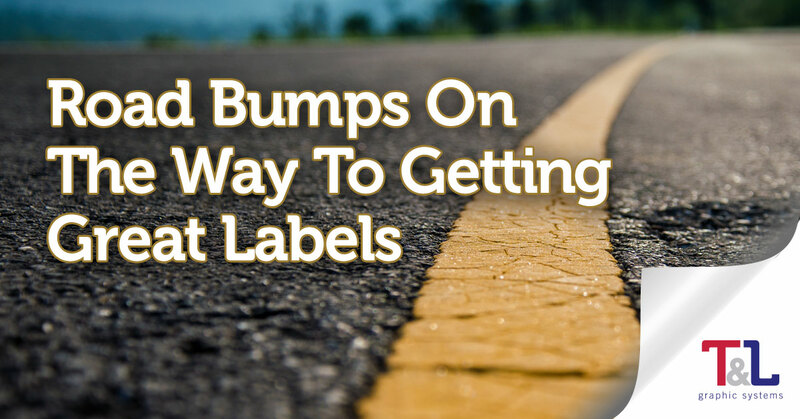 Here are some of the road bumps and pot holes you may encounter on your next label job and what to do to fix them. No two screens display color exactly the same way, nor do they match up with the way in which a flexographic press prints colors. This means that what you see on the screen may not match what comes off the press. Here’s how our system gets the color spot-on, every time: We utilize a high-end digital proofing printer that is calibrated to the exact color profile of our flexographic press. We show these proofs to the client and also give a color matched proof to our press operator, so he has a precise understanding of the color values that must be achieved on press. Most label printers don’t have a color match proofing system which makes it much harder for you to imagine what your job might just look like, or NOT look like.. Sometimes, we receive artwork in the form of a PDF file and frequently the file doesn’t contain all of the data we need to create a high-quality label. Missing logos and fonts are often the stumbling blocks. If we’re lucky, we can re-create the artwork but this process gets complicated because of the huge number of fonts that are available today. The best format for label artwork is EPS. This file format contains the vector and font data we need to successfully complete the project. Often, food companies will trial multiple variations of products and labels as part of their consumer research process. They will produce small batches of products and will digitally print 100 or so labels of each variation to be used in limited-run consumer tests. Once the food company has finalized their product and label design, they use flexographic printing to produce the labels in quantities, because it is much less expensive than digital on a per-label basis. There’s only one problem with this approach: Labels produced on a digital press will not look the same as those that are produced on a flexographic press. Many digital presses are doing color matching of label designs using a range of 6 to 8 colors whereas a flexographic press will typically use just 4 colors to properly match them. It’s more accurate. The best solution is to use printed proofs whenever possible. A common mistake we see in label designs is improperly formatted vignettes. Vignettes are gradient screens and often, they are formatted using a color range that goes all the way to zero (gradient fades to white) . A flexographic press cannot accommodate a gradient screen value of zero and as a result prints the file incorrectly. Taking a proactive approach, T&L we typically open the file and adjust the gradient to print correctly. In other words, we don’t simply run the files a customer gives us – we take steps to ensure they will print properly, saving you time and money. 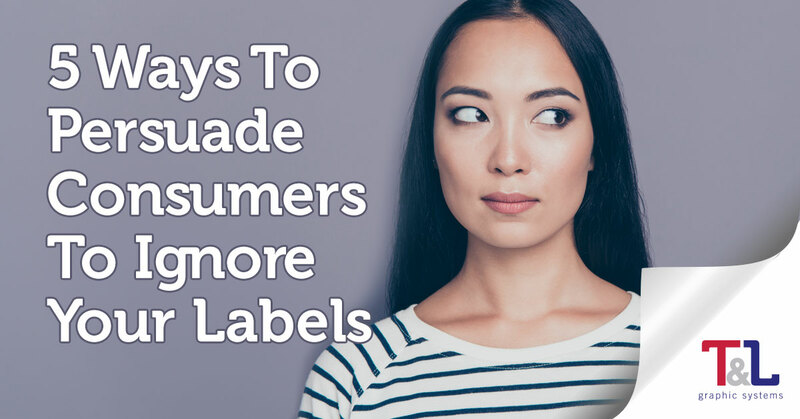 Q: What should customers keep in mind regarding label design? Galeles: Type should be simple in color. Black is best. A single color is fine. Multiple colors of type that would require a four-color printing process can look fuzzy and can be hard to read when printed. Fonts should be easy to read. The type should not be so close together that it would be easily fill in. If your artwork includes screens with gradients, you should avoid gradients that go to zero value (fully transparent), especially into a large blank space. The longer the transition to zero, the harder it is to reproduce during printing. Q: When it comes to artwork, what type of image files do you prefer to work with, vector or bitmap? Galeles: Vector files are sharp and clean at any size. But they also have several other advantages that are specific to label printing. Color is easier to control. Sometimes it’s better to convert a color to a PMS solid color rather than run it as a four-color process. Adjustments, bleeds and traps can easily be made to the file to take advantage of the flexo printing process. In addition, vector files are more stable and are less likely to have compatibility issues from computer to computer. They are always high resolution. Q: Who usually designs the label at the client company? How often do you get involved in designing labels for clients? Galeles: We are not graphic artists. We do not design labels. From time to time, we have designed labels and product lines in the past, but they have been very simple in nature. I have been in the graphics industry for 34 years in several capacities. In addition, our art department staff has a great understanding of what designs will work in the flexo process and what will not give favorable results before we go to press. We can help and advise our clients and even modify their designs within reason to help ensure that the finished product meets their expectations. Q: What are the most common problems you encounter with client artwork? What are some simple fixes to these challenges? Galeles: Low-resolution files under 600 dpi are usually problematic. Sometimes it may only be a small art element like a Facebook logo. People take graphics from the web to use for artwork and they are usually only 72 dpi – low resolution. These images will reproduce as fuzzy and illegible; they are almost always unusable for label designs and printing. Fonts can also be challenging. Nobody can carry every font. Some designs have special creative fonts. The customer needs to convert them to paths or include the fonts when sending the art file. Drop shadows do not always reproduce as well as our customers think they will. When they use creative effects like drop shadows, these effects don’t always print the same way as they appear on the monitor. Drop shadows are very rarely just black, forcing us to run jobs with them as four-color processes. The next problem with effects is that they do not scale proportionate to the object. When customers have a logo that contains elements like shadow effects, and they have a logo that is ½” x ½” in size, the drop shadow may be equal to 25 percent of the size of the logo. Increase that logo to 2” x 2” and that drop shadow effect may only be 6 percent of the logo. In other words, the drop shadows become inconsistent at different image sizes. This is not always noticeable on the monitor, but it’s definitely obvious when printed. Photos are great but they should not have extreme highlights or burn outs. Those spots in a photo that bleach to white will never look good printed flexo or any printing process. For best results, avoid images with lots of bright areas and lots of dark shadows. Now that you have a better understanding of label application issues, why not download our new guide, How to Create the Perfect Label: The 5 Most Important Questions to Ask.